Published March 22, 2019 By Leisa Good This post may contain affiliate links. Regardless, I only recommend sites I've researched and/or used and trust. Do you have a background in editing or reporting? Do friends and family constantly want you to look over their writing for typos and spelling errors? Do you think you'd like to find a proofreading job that you could do from home? Well, then keep reading as you will be introduced to a company that will allow you to do just that. As its name easily implies, ProofreadingServices.com, is an online company which allows you to work from home proofreading a variety of written works from authors, academia, and businesses. Founded in 2011 by Yale graduate, Luke Palder, it was originally called ProofreadingServices.US until 2013. Based in Florida, the company claims to have 5,000 clients in 90 different countries. Many of their clients would be names that you would recognize, such as Cisco, MIT, IBM, Vogue, Pearson, CNet, Harvard, and the University of Cambridge. While their main focus is on proofreading, they also offer 50 other services such as resume writing, eBook cover design, transcription, translation, and ESL tutoring. Most of these skills are advertised for using other channels. However, to keep this post focused and on point, we will only discuss proofreading. Even though many times the two terms are used interchangeably, there are differences. Proofreading is the finding of overall mistakes in grammar, spelling, verb and noun agreement, correct sentence structure, and anything considered “structured”. I like to think of proofreading as finding the “embarrassing” mistakes in writing. 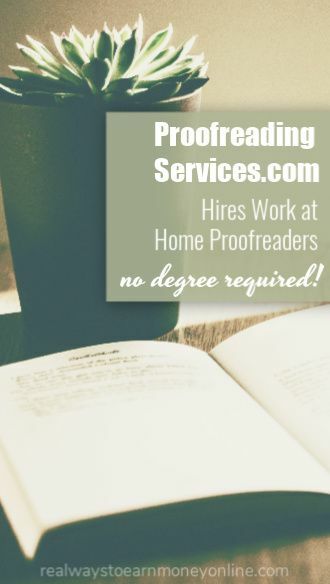 What Are the Professional Requirements to Work at ProofreadingServices.com? The main professional requirement is to pass the 20-minute proofreading test with a score of 95% or higher. You won't be able to create an account or do anything else until then. According to the owner, only about 1 in 300 can pass the test. It is not clear as to how soon if ever that you are able to retake the test. The good news is that you do not have to be from the United States to work there. As long as you can pass the test, location is not important. If accepted, you would be given style guidelines to follow. This is typical of any company offering proofreading, editing or writing services. What Are the Pay and Hours Like at ProofreadingServices.com? type of document being proofread. length of the document being proofread. According to one of our readers, ProofreadingServices does ask you to take a grammar test when you apply. Then, after the grammar test, you have to work on sample edits and this is unpaid time. It is possible to be rejected when you are at that stage, so this is a risk. How Would Interested Individuals Apply to ProofreadingServices.com? Simply go to their website and click on Apply. Click on the link to go to the proofreading test. Working for yourself is usually the most profitable route to take because you can set your own rates and seek out higher-paying clients. You'll likely earn more doing this than you would if you were applying for entry level proofreading jobs online such as those listed above. If you'd like some guidance in getting started, we recommend checking out this free 45-minute workshop explaining how to go about starting your own freelance general proofreading side hustle from home. I’ve applied to this company numerous times the last few years, even as recently as last month, only to receive the same “automated” response each time. I have over 20 years experience in proofreading, editing, copywriting, writing, etc., and they have never been in touch. Only by automated email one time, after “submitting” my application and CV, with a sales pitch to read some of their books on proofreading. Seems a bit off, if I may be so bold to say. I am interested in editing and/or proofreading. I was an English major in Jr. college and had experience proofreading a novel a while back before it went to the publisher.